Hotels in Richmond were costing an arm and a leg, Husband suggested trying out a Premier Inn, my response was luke-warm to say the least. However a bit more research and I thawed slightly, reviews seemed good and it looked fairly new, also while not exactly cheap it was a bargain compared to the other Richmond alternatives so we took the plunge. An added bonus was a car-park so no worries about where to stash our car – £12 for twenty four hours was also, I thought, incredibly reasonable. Check-in was a pleasant surprise too, the reception area was manned with a helpful and exceptionally friendly receptionist. Friendly staff here were the rule not the exception. Our room on the second floor was huge, bright, pristine and just not what I was expecting – this did not feel like a budget offering to me. A huge bed with a choice of firm or soft pillows and a big thumbs up from Son about the quality of his single bed – vastly superior to the normal camp bed offering in a lot of hotels. With tea and coffee facilities, a flat screen television, big bathroom and stack of fluffy white towels I was completely sold on this place. A little bit of a walk into Richmond – about twenty minutes – not exactly central but that didn’t bother us one bit. 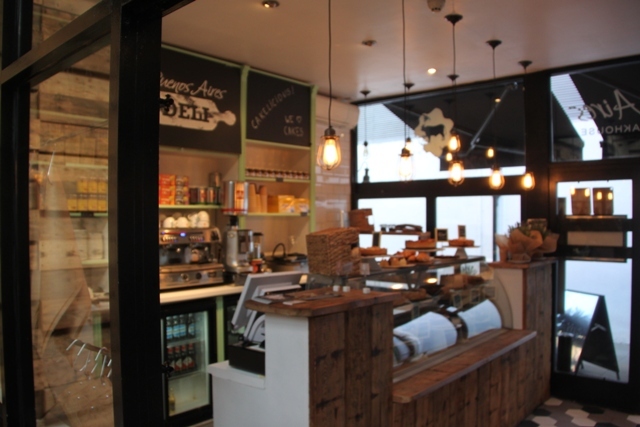 We had a great sleep and a great breakfast – Son loved it and kids eat free. There was also free WiFi in the room, fast enough and fine for us. No end of options in Richmond when it comes to dining, we found numerous independent eateries and felt spoilt for choice. We nearly dined on our first evening in a quaint little pub overlooking the village green until Husband remembered an Argentine steakhouse he had spied earlier. Beef won us over and we headed for Buenos Aires – nearly empty at 7pm when we got a great table and completely full half an hour later. 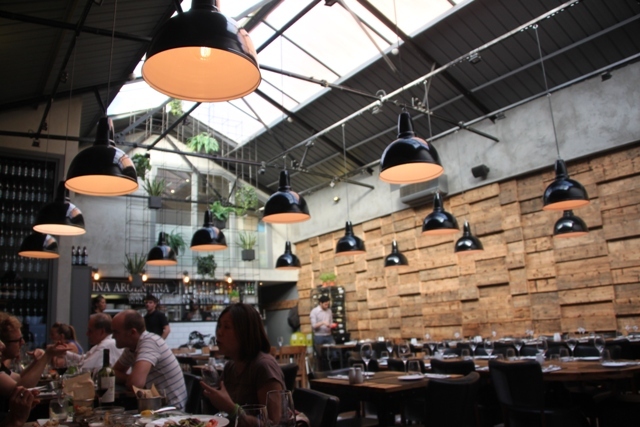 A modern take on an old warehouse, I loved the decor. 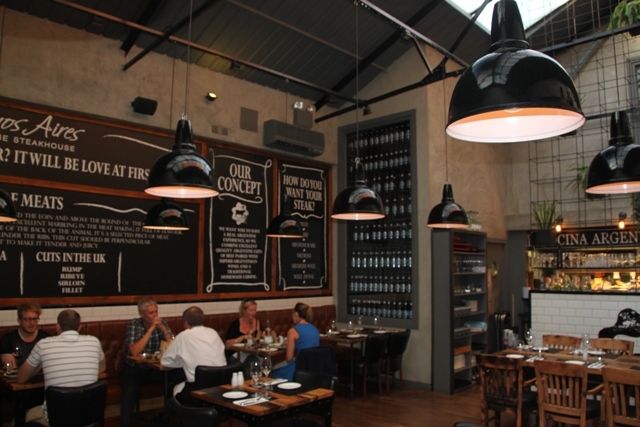 We feasted on perfectly cooked steaks with salad and chips – plain but delicious. 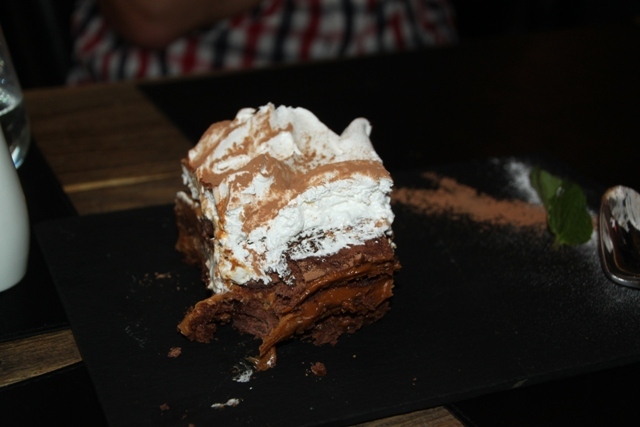 The pudding was the piece de resistance though – a massive hunk of chocolate cake with meringue on top, seriously delicious and baked in their little in-house place at the front of the restaurant. We resisted the chance to buy any more to take home – calorie overload for sure. 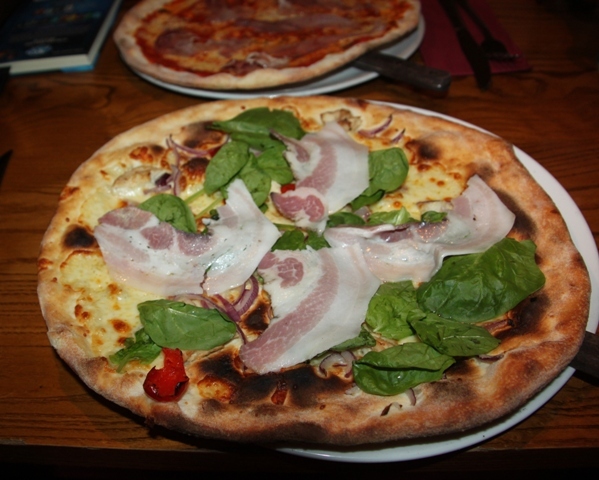 Next evening we chose a tiny little place to eat – Pizzeria Rustica. Very authentic and very rustic, inside it was full of nooks and crannies and very dark – I loved it. We got the last table right by the kitchen, not ideal but the menu was. An eclectic and unusual choice of pizzas, we all picked something different but I was exceptionally happy with my BBQ offering and didn’t want to share. Another great evening and perfect way to end our short stay in Richmond. I know Dee – I would go back there again just for that, it was the best!! Bathrooms make or break the accommodations for me and this one looks great. Good choice on the eateries as well. I love the vibe at the steakhouse and a chocolate coma is always the prefect ending to the day. Completely agree, the bathroom for me is so important and I was so impressed with this place, we seek out this chain now for our trips. The food in Richmond was divine – so many great places to choose but I think we lucked out with our picks! Same goes for us Suzanne, we don’t stay in the room apart from sleeping so if it is basic and clean that’s fine. We were so impressed we have already booked with this chain for a couple of trips later in the year – paying less means more trips, that works for me!! I totally agree and that was the reason we always selected one of the budget chains for our travel…we did travel a lot so this truly helped…The chain we used was the IBIS chain part of Accor. The rooms were small and bland but the service was great. Their IBIS Style was a little more funky and included a good breakfast. Will keep the IBIS in mind too – thanks for the tip!! Budget hotels definitely get my vote now. Premier Inn is my favourite! I am going to Belfast this year and all of the alternatives are way more expensive! I was surprised just how good it was Andrew. One of my friends has been raving about the chain for a while, it fell on deaf ears but finally I am converted. So much so that we now seek them out – two booked for a trip later in the summer. A good price and you know what to expect, that works for me. If I can get a good deal I sometimes book a family room and take my grandchildren away for a night – they love it! Mmm – that chocolate cake looks amazing! It tasted even better than it looks and that’s saying something!! Those pizzas were soooo good!! The hotel and the pizzeria look really great! Thanks for the tips! Both were superb – highly recommended for sure!! The budget hotel chains have really started upping their game in recent years. 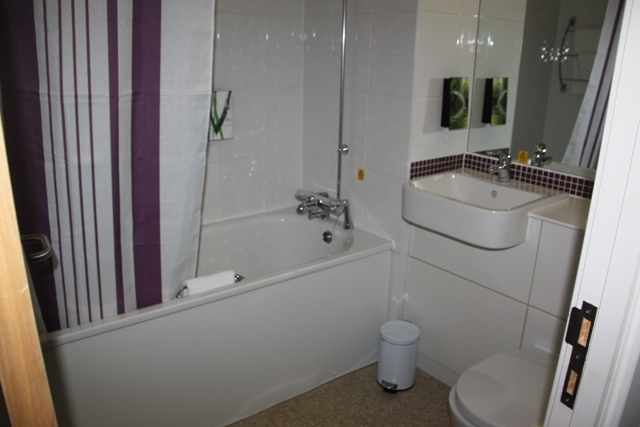 In Britain, we always had to take two rooms because most cannot accommodate six people in one room so we always went the cheapest option and we have definitely noticed the quality improving. We are like you and really make the most of our days of travel so we only ever need the hotel room to be a dormitory. Therefore, as long as it is clean, has a nice bathroom and a comfy bed then we don’t care about any other bells and whistles. The shots of pizza and dessert literally made my stomach rumble. 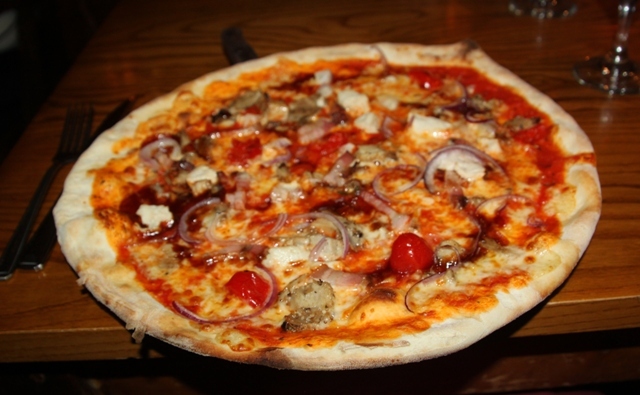 Oh that pizza and dessert was just as good as it looks – probably better, yum…. We have started to seek out the budget offerings now too, I think like you say they have really upped their game. We even stayed in a Travelodge on our Bank Holiday weekend – also surprisingly good, no reservations about staying there again either. Yum yum and more yum. Keep sharing your delicious adventures – we are living through them! That food was just great, still drooling even now….. Thank you for your lovely comments! So true George, food can make or break it – we love our food!! This was great stuff – I hanker after that pudding still…. Sounds like you ate well-the pizza looks delicious! Glad to hear premier inn was nice, we are staying in one soon and despite good reviews I’m a little nervous of how it will be. I felt the same – not sure at all but was so surprised and now have no hesitation at all. In fact we stayed in another Premier Inn in London in January and have just booked a couple for summer trips. 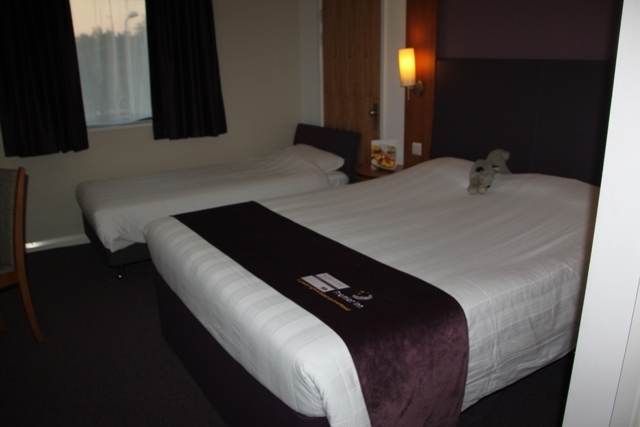 We even tried out a Travelodge last week and that was fine too – prefer Premier Inn though but I would go back!! Oh that cake Pam – seriously delicious, one of the best cakes I have ever tasted (and I’ve tasted a fair few)!!! Whoever thought of that combination Rosemary was on to a winner – it was so delicious I am still drooling when I think of it!! Not great on the calorie content I’m sure, just plenty of walking the next day to sort that one out!! I agree about the Premier Inns (now) – we have even booked a couple for a summer trip later this year and I’m looking forward to staying there again. My son loves the breakfasts too – he’s never excited about food so that is saying something. Enjoy your weekend too. A piece of that cake would be good!! Oh they were so so good Melissa, I’m still drooling….